By now, most GTA soccer fans have seen Ryan Telfer's first MLS goal. Back in May of 2018, the deputized left winger came barrelling down, unmarked, into the 18-yard box from out wide and made no mistake in smashing a cross into the net, snatching a victory for Toronto FC from the jaws of an otherwise ordinary draw. Now, Telfer – who joined York9 FC on loan from TFC this year – is eager to produce similar moments for the Nine Stripes. "[The Canadian Premier League] is a new league, a new team, a whole new setup for what soccer is bringing to Canada," Telfer told CanPL.ca. "I wanted to be a part of that." The 25-year-old Mississauga native quickly endeared himself to TFC fans last year with his pace on the left wing. Although he'd only played 29 professional matches with Toronto FC II of the USL before making his MLS debut, his presence was felt immediately. Telfer's ability to blow past defenders, with or without the ball, and find his way into the box made him an electrifying player to watch in all of his limited first-team minutes. 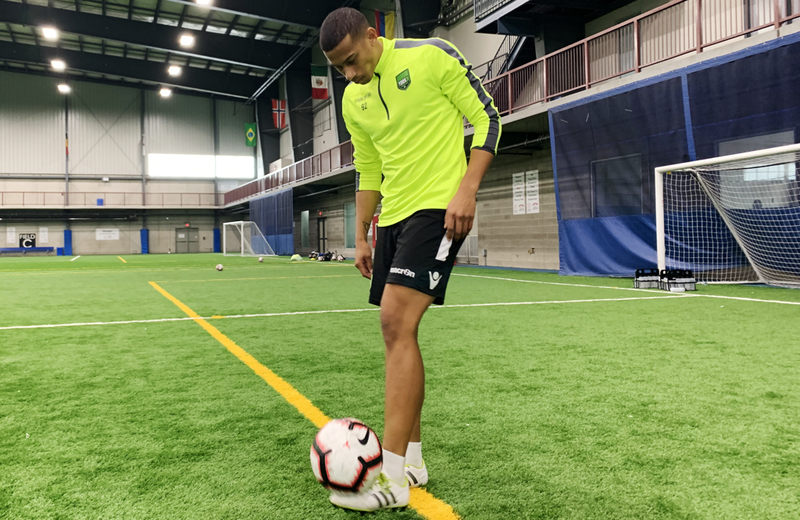 That pacy, exciting style of play is something Telfer now expects to bring to the CPL: He's confident that York9's staff – both from watching him in training and chatting with the coaching staff at TFC – will find the best way for him to put his quality to good use. "The idea for me is still to be in that midfield lineup, whether it’s out wide or more central," Telfer said. "The qualities I bring to the game, going up and down [the field], it'll be the same that I bring to York9." The versatility Telfer hinted at will be another asset for the Nine Stripes. His natural position is a little further back than where he played for TFC, having developed as more of a left back or wingback. So, York9 coach Jimmy Brennan could slot Telfer in anywhere from his back line to the flank of a front three, depending on how he wants to counter his opponent. Telfer could comfortably complement a five-man midfield, using his pace in transition to feed strikers like Simon Adjei or Michael Cox. Or, he might remain further up the field, looking to find space either to create chances or score them himself. With a similarly versatile attacking player in Kyle Porter, York9 could be extremely dangerous from the touchlines this season – especially with the tactical flexibility at Brennan’s disposal. The historic nature of his move to York9 is not lost on Telfer, either. He’s the first-ever MLS-to-CPL loan signing, meaning he’s setting out into hitherto-uncharted territory. Prior to making the move, he hadn’t met Jimmy Brennan – although he had seen his new boss’s picture on the walls at BMO Field. That said, he’s not in entirely unfamiliar waters. When York9 play their home games this season, Telfer will be returning to the familiar confines of York University. That’s where he spent two years at one of Canada's top U SPORTS soccer programs, after all. It’s where the Lions (including York9 players Michael Cox and Colm Vance) won the 2015 CIS championship in Telfer’s rookie season; where Telfer earned his OUA West second-team all-star honour in 2016. "It's certainly nostalgic, to get a chance to play where you came from," Telfer said. "It’s a nostalgic feeling that I’ll be back at York again playing in front of the fans." Carmine Isacco, Telfer’s head coach from his university years and in League1 with Vaughan Azzuri, and now an assistant coach at York9, will be a familiar face as well. There's just over a month remaining before Telfer and his teammates step out at Tim Horton’s Field to play Forge FC in the CPL’s Inaugural Match – and Telfer is excited to get going. "It's a once-in-a-lifetime feeling," he said, "to be playing in a game that's the first of what the CPL may become, knowing that you’ll be a part of that history." Having already made league history on one front, Telfer is surely hoping to notch his name alongside a fair few more in the months to come.